A comic book adaptation with heart, Spider-Man combines eye-popping special effects with a human-centred focus on love and loss. Some of the acting is cringe-inducing and the dialogue echoes the juvenile source material, but there is plenty of thrilling action and honest emotion to cover the film's shortfalls. Nerdy New York high school student Peter Parker (Tobey Maguire) has a crush on Mary Jane Watson (Kirsten Dunst), literally the girl-next-door, but she barely acknowledges his existence. Peter lives with his aunt May (Rosemary Harris) and uncle Ben (Cliff Robertson), and his only friend at school is Harry (James Franco), the son of wealthy military industrialist Norman Osborn (Willem Dafoe). On a school field-trip to a genetics laboratory, Peter is bitten by a genetically modified spider, providing him with dramatically enhanced senses, incredible reactions, overpowering strength and the ability to create and swing from spider web-like threads. After the tragic demise of Ben in a car-jacking incident, Peter gradually learns to control his new powers and adopts the persona of Spider-Man, a crime-fighting super-hero. Meanwhile, Norman's company Oscorp is about to lose a key military contract. Under pressure, Norman subjects himself to an experiment that goes horribly wrong, and he develops the evil powers of the Green Goblin, a monstrous alter-ego bent on destruction. As Peter struggles to balance his new life as Spider-Man with trying to win the love of Mary Jane, she starts a relationship with Harry, as a showdown looms between the Green Goblin and Spider-Man. 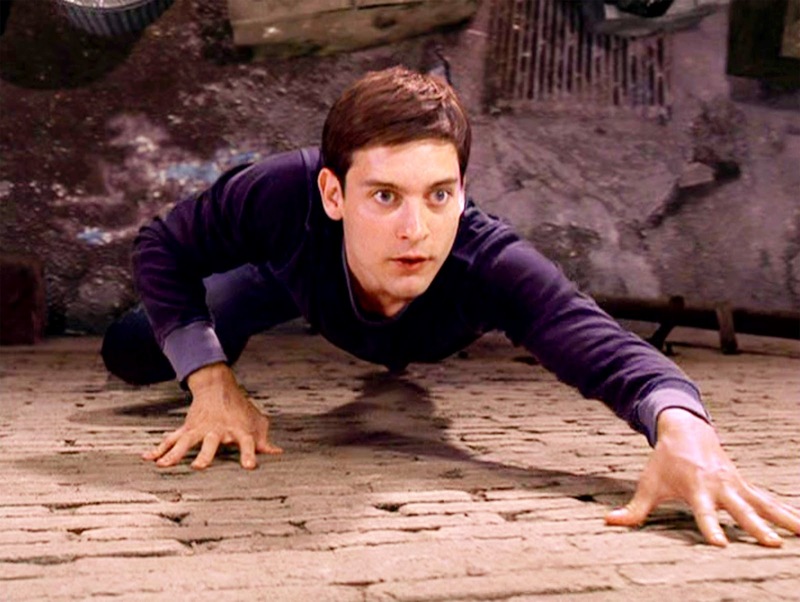 With director Sam Raimi consciously crafting a superhero film with emphasis on the people behind the costumes, Tobey Maguire's performance as Peter Parker is the hinge on which the movie rests, and for the most part it's a precarious balancing act. Maguire is either appropriately naive and thoughtfully working through his issues as the bookish Peter is unexpectedly thrust into the role of superhero, or as an actor he is overwhelmed by the role and caught like a black spider against a white background. The suspicion is never confirmed either way, and Spider-Man eventually thrives on the strength of the other cast members and Raimi's visual flair. Willem Dafoe leads the way, his smarmy business executive the perfect gateway to the Green Goblin monstrosity created by his subconscious. Kirsten Dunst is engaging as Mary Jane, her off-beat beauty perfect as a girl seeking any escape from a horrible home environment but for the longest time overlooking the one relationship that will save her soul. The romantic sub-plot between Mary Jane and Peter keeps the characters ahead of the chases, but does not avoid a fair number of sappy moments as the David Koepp screenplay struggles to force its way into the world that adults inhabit. However, the justifiably famous upside kiss in the rain that Peter and Mary Jane share more than makes up for most of the rest of the clunkiness in their relationship. Cliff Robertson as Uncle Ben Parker adds the welcome acumen of grizzled veterans, injecting just enough wisdom at the start of Peter's adventure to guide his heroics. J. K. Simmons is given free reign to add over-the-top humour as the old-fashioned, highly-strung editor of The Daily Bugle, a tabloid that latches on to Spider-Man's antics. Raimi effectively integrates the computer-generated visual special effects into the narrative, Spider-Man's impressive speed of travelling from building to building in Manhattan a genuine joy to watch, and the climactic battles between Spider-Man and the Green Goblin causing satisfying carnage amongst the high-rises and bridges of the city. 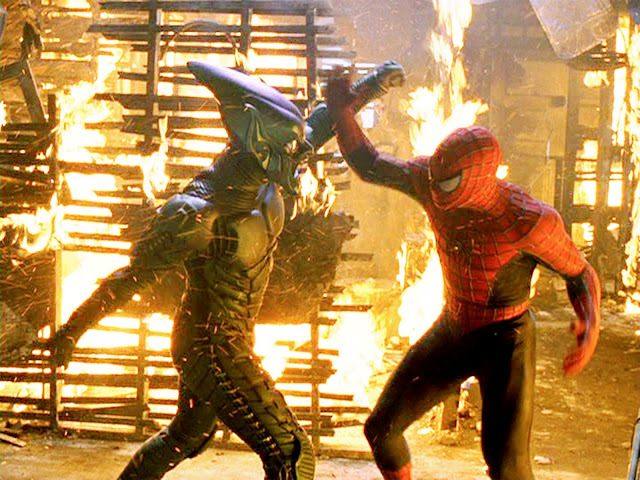 The Goblin is a worthy adversary, but Spider-Man has an effective bite back.